The development of novel functional materials capable of solar-driven chemical transformations or production of electricity has attracted significant interest motivated by the need to develop technologies based on clean and sustainable energy supply. One of the most safe and environmentally friendly chemical methods aimed at removal of pollutants from water and air by using the renewable energy sources e.g. solar energy is metal-oxide heterogenous photocatalysis, in particular wide-bandgap semiconductor systems applying titanium dioxide. However, utilization of titanium dioxide is hampered by the fact that, due to the large bandgap, it can make use of only a very small UV part of solar radiation. Therefore strong efforts are presently made to shift its photocatalytic activity to the visible spectral region. 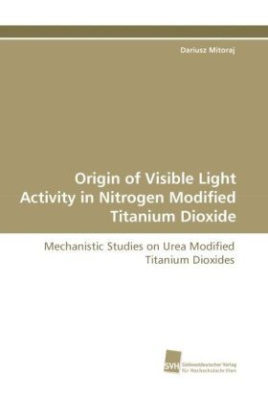 Explication the mechanism of urea-induced titanium dioxide modification, elucidation the electronic structure of the new visible-light active materials together with literature review on nitrogen doped/modified titanium dioxide make this book suitable for everyone working in the field, from postgraduates to experts.